A reliable and precise z axis end stop switch is very important since it determines the quality of the first layer. When printing with layer thicknesses of 0.2mm or even 0.1mm then it is obvious that the precision of the z-axis switch must be significantly better than this. One turn of the M3 adjustment screw gives 0.5mm. 0.05mm are 36° rotation of the screw. Also the bed might be not 100% horizontal (when having a glass plate it can at least be assumed that it is flat. With a PCB this is not the case). It is therefore a common habit the print the first layer thicker to equalize those tolerances. 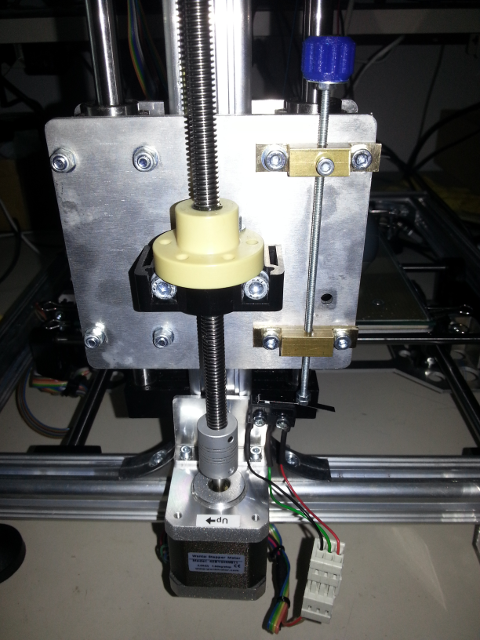 The original Z axis stop switch assembly works but it is far away to be adjustment friendly. No need to go with a screwdriver between switch and adjustment screw to adjust. No counter nut to fasten it and having therefore a potential to turn the adjustment screw again. Having a simple way to electrically check that the switch has been activated. A simple plug that allows to connect a ohm meter is a way. Using the 3rd pin on the connector and adding a LED would be an other option. However an LED light up the controller board must be prepared to deliver a voltage. The controller is prepared for that but unfortunately it is not clear how to do it. Make sure that the switch can be electrically observed. Either disconnect it from the controller board and add an Ohm meter or other means as when having added an LED. Engage the switch by hand to be sure it works. Turn the adjustment screw down until you hear a click and you see that it has electrically switched. Make that the motors are not powered (e.g. a simple reset to the controller board) then move the bet by hand to the center and check with the feeler gauge that the distance is again 0.1mm. If not loop this instruction list until it is so. The ultimate test is start printing and at the first layer interrupt it (as pressing reset) then check the distance with a feeler gauge and compare with what the printer thinks.